Q: Throughout your career, you have had a wide variety of experiences, in the classroom as an educator, in the business world and as a technology innovator. How do these experiences impact your work here in Norwalk? A: My motto is Every Kid, Every Day. It comes down to the child first. That’s one of the things that is so attractive about working here in Norwalk. We have a truly dedicated group of people who want the same outcomes for children…to be successful in school and in life. When my career ends, I would like my legacy to be creating a replicable model that other communities can use and do the right things for kids. That’s possible here and the pieces are falling into place – it’s 100% doable. Q: How did your professional path lead you to an interest in technology? A: My graduate degree is in Educational Administration and before that, I taught 5th grade for nine years in Stamford. However, my undergraduate degree is in Jazz Studies and my instrument is the guitar. I did a lot of arranging and to hear your pieces you had to learn the keyboard. I didn’t really want to learn how to play keyboard, so I picked up a computer and I started programming. One thing led to another and I started integrating computers and music. Q: How did that experience lead you to an interest in integrating technology into the classroom? A: Early in my career, I worked at a company that focused on integrating technology into the classroom. We designed some software called My Learning Plan originally intended as a tool for administrators to use for professional development. We still use it here in Norwalk. I then worked in the New Haven Public Schools as the Educational Technology Coordinator, and a few years later came to Norwalk as Director of Technology. Q: Didn’t you also have other experiences in the business world? A: Yes, I went to work as Senior Vice President for GEMS, a global provider of private school education, headquartered in Dubai, with 70 schools offering eight world-class curricula in 14 countries. There, I focused on public school reform, creating private K-12 educational opportunities, and charter school management. I designed innovative technology for schools; everything from what does the modern classroom look like to how to integrate technology into existing curriculum. Q: What did you take away from these experiences and how did it bring you full circle back to Norwalk? A: GEM was started by Dr. Manuel Rivera, who was ultimately responsible for me coming back. 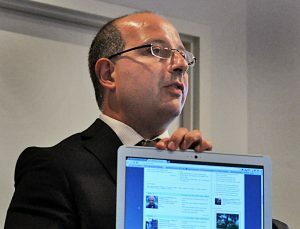 He was named Superintendent of the Norwalk Public Schools (NPS) in 2013 and was looking to restructure his department. He hired me to create partnerships and bring technology into the classroom. Q: Can you elaborate on the important role of community partnerships? A: One of the challenges is getting all the puzzle pieces to work together as a whole. You can’t rely on one entity to move the needle. When you think about Norwalk ACTS’ role in the community and how it brings the right people around the table to have a collective impact, that’s enormously meaningful work. While I don’t think anyone has fully accomplished this to the level we’d like to see yet, one of the things that brings me to work every day is that I truly believe that Norwalk is the place where we will do it…we will improve the lives of our children here. Q: What else does it take to be successful at Collective Impact work? A: I have been blessed to have worked with professionals who are transformative and bring national experience to the table. They share a greater vision for our students and educational system, plus they know enough about operations to make things happen. Q: Can you discuss the role of data in this work and how we are measuring success? A: People must realize that the District focuses on how to get a child to succeed academically, but it’s the community that helps with the whole child. The District cannot take on the task of educating the whole child. When you examine the work of national leaders in the field of early childhood education, such as Geoffrey Canada of the Harlem Children’s Zone, he is focused on the idea of creating a portfolio for the whole child, not just academically but as a successful person in every facet of their lives – socially, emotionally, physically and more. The problem is that you can only improve on what you’re measuring. The hard part is how do you measure those types of successes? We are starting to make progress in these areas and are meeting these outcomes because we have measurements in place to strive towards. Q: Can you describe the value of the data sharing agreement NPS has with Norwalk ACTS? Norwalk ACTS is a Conduit that helps aggregate these pieces together. If the data is isolated, you’re working in isolation and you’re never going to achieve your goals. How can you measure something if you can’t put stats in the same bucket for comparison? Q: At Norwalk ACTS, we refer to DATA as a flashlight not a hammer. Do you see attitudes across the city changing when it comes to data? A: It is definitely shifting. Stephen Covey once said, “Action works at the speed of trust.” We say it’s a flashlight, but it’s human nature to take things personally or internalize if you’re not moving forward in a way that others would like to see. I think we are moving toward trust in Norwalk. When you constantly see success, and you see that all the key players are there, learning and growing, and the kids are progressing, then people start coming to the table. That is starting to happen. Now it’s our job to keep that momentum moving forward. Q: Please define the “Digital Divide” and discuss how it is impacting Norwalk students. A: Nationwide, close to 70% of teachers assign homework that requires access to the internet, yet 5 million households with school-aged children do not have high-speed internet. Our basic surveys, along with census data, show that at least 8-10% of our K-12 students do not have quality internet access at home. 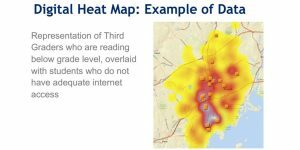 We used city data and Norwalk ACTS TEAM Summer survey data to see which households do not have internet at home and overlaid that with data on students who are not reading at third grade level. There was a clear correlation. Q: Now that you have this data, what action plan are you putting in place? A: Sprint approached me about the 1Million Project, the mission of which is to help close the opportunity gap by giving high school students reliable, home internet access. 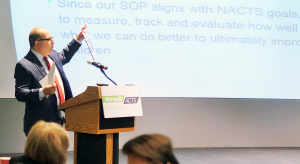 Last year, Sprint connected 90,000 kids nationwide, but Norwalk is the only district in Connecticut which received the grant. The Norwalk pilot project rolled out at the end of January to approximately 300 students at Norwalk High School, Brien McMahon and Pathways. Students received Chromebooks, a case and Wi-Fi Hotspots. We are starting with a small group to get the process going, but have plans to expand. Q: What is the long-term objective of the 1Million Project? A: How can we give kids homework if they don’t have access to get the homework done? It essentially allows for an extension of the school day beyond the walls of the school. It allows teachers to engage in 21st century learning skills. We are now a Google District that promotes Google classroom and collaborative online environments. We are seeing a shift in the right direction. Q: In what other ways are you integrating technology into the schools and community? A: Our community is data rich, but information poor. We need to figure out what is the most important data we need to gather and then hone it down. At that point, it will become more realistic. We’re not there yet. We are working with Norwalk ACTS to create “Digital Dashboards” – different ones for specific groups. We’re starting with a dashboard for the Board of Education, providing them with a useful tool that allows them to interact with the data, understand it more readily and ask the right questions. We need to figure out what the questions are before we can look for the answers.